Unlike many of her fellow demon lords, Zuggtmoy has been a major D&D villain for decades. Her first starring role occurred back in the 1980s. However, the Demon Queen of Fungi’s more recent claim to infamy is as a recurring foe for adventurers in Out of the Abyss. Of all the demon lords, Zuggtmoy’s real-world origin might be the most convoluted. It starts with The Temple of Elemental Evil—a megadungeon that Gary Gygax began playtesting in the late 1970s. He had intended it to be a lair for two of his mightiest villains: the spider queen Lolth and the Elder Elemental God. But then David Sutherland used Lolth as the major villain in the adventure Queen of the Demonweb Pits (1980), forcing Gygax to rethink his ideas about the temple. Fortunately, Gygax knew that Sutherland was using Lolth early on, and so he was able to introduce a new villain into his playtests: the fungus queen Zuggtmoy. She was even foreshadowed when the first part of the Temple was published as The Village of Hommlet in 1979. That adventure featured a scarab with the inscription “TZGY”—inspired by Zuggtmoy/Tsuggtmoy (two variant spellings of the demon lord’s name). The publication of the rest of the Temple of Elemental Evil was rather famously delayed for half a decade. In the meantime, Zuggtmoy was referenced here and there, creating foreshadowing for her eventual appearance. Both editions of The World of Greyhawk campaign setting (in 1980 and 1983) told of ancient battles at the temple and how Zuggtmoy had been imprisoned there. Then Monster Manual II (1983) noted her as one of the rulers of the Abyss. With the publication of The Temple of Elemental Evil in 1985, these hints were finally fulfilled. Players could now explore the entirety of the massive dungeon, including the sections that acted as Zuggtmoy’s prison. And if they were very unlucky, they might accidentally release her—as Rob Kuntz’s Robilar had done in Gygax’s playtests, following his solo looting of the entire dungeon complex! Zuggtmoy was just the second demon lord to appear in a D&D adventure, following Lolth’s debut in Queen of the Demonweb Pits. She was a major foe in her first edition AD&D form, with 49 Hit Dice, plenty of spell-like abilities, and even psionics. She ruled over fungus and had two equally disagreeable forms: an old crone and a bulbous puffball mushroom. She was also acknowledged as the ruler of the 222nd layer of the Abyss. With such a notable history, it would have been easy to expect Zuggtmoy to continue as a powerful presence in the game after the end of the Temple of Elemental Evil adventure. But instead, she largely disappeared for a decade and a half. Zuggtmoy’s largest role in the years that followed was in Gary Gygax’s Gord the Rogue novels (1985 to 1988). This started with Sea of Death (1987), in which she was one of many demon lords seeking the “theorpart”—a fragment of a legendary evil artifact. Over at TSR, Zuggtmoy got almost no attention at all. Like most of the demon lords, she was cast out of the game with the publication of second edition AD&D in 1989. In the decade that followed, her name started to reappear, but the references were still minor. The Greyhawk sourcebook Iuz the Evil (1993) briefly detailed the alliance between Iuz and Zuggtmoy that led to the rise of Elemental Evil. References during the same period in the Planescape line were little more than name-dropping. Worse, Planescape’s Planes of Chaos (1994) gave away Zuggtmoy’s home! The ooze-like demon lord Juiblex also got to set up camp on the 222nd layer of the Abyss, mixing fungus and jellies into a foul morass. Zuggtmoy got a bit more attention in Return to the Temple of Elemental Evil (2001), one of the earliest adventures for third edition D&D. That adventure answered the question, “What was a fungus demon doing in an elemental temple anyway?” The answer was that Zuggtmoy had been acting as a cat’s-paw for Tharizdun, the insane Chained God. Dragon 285 (July 2001) tied to the adventure by providing more background on the Temple of Elemental Evil and its cult, but Zuggtmoy was a minor part of this, fading away before the new secrets of the cult. Nonetheless, Return to the Temple of Elemental Evil marked a new era for a classic villain, and would help to return Zuggtmoy to the heart of D&D lore in the twenty-first century. During the next decade or so, Zuggtmoy got some serious attention that began with a computer game. Troika Games’ 2003 release of The Temple of Elemental Evil revisited the classic dungeon and thus gave Zuggtmoy a new spotlight. 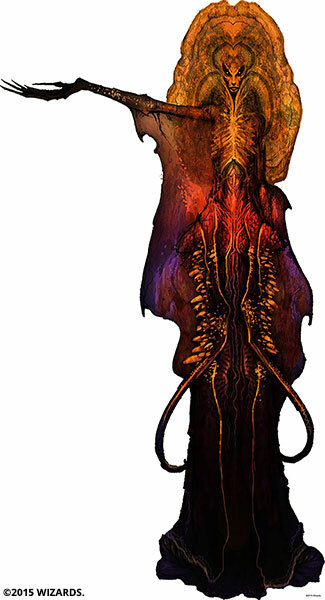 The game also reimagined Zuggtmoy as a beautiful fungoid woman—a depiction that was kept for her next major appearance in Dragon 337 (November 2005). That issue featured a “Demonomicon of Iggwilv” article on Zuggtmoy, which provided the best details ever on the demon lady of fungi. It pieced together her history, described her cult, and even detailed the abyssal layer known as the Slime Pits that she and Juiblex now shared. This background was then carried over to Fiendish Codex I: Hordes of the Abyss (2006). Zuggtmoy made her fourth edition D&D debut in Demonomicon (2010). In the World Axis cosmology, it was her role as Lady of Decay and Queen of Rot that rose to prominence. However, her most notable fourth edition appearance might have been in Dragon 425 (July 2013), which provided more details than ever on the cult of Elemental Evil—solidifying all the backstory from Return to the Temple of Elemental Evil a decade earlier. 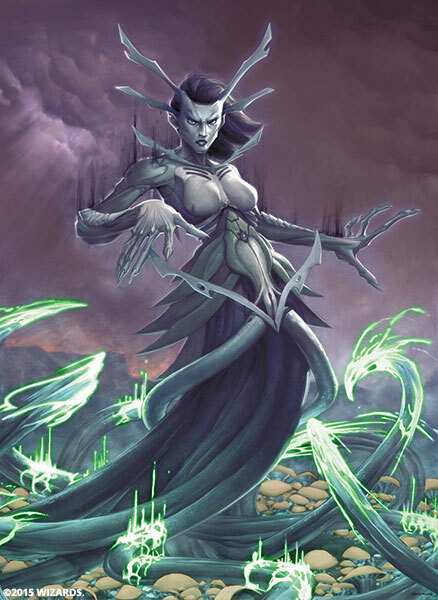 Making her fifth edition D&D appearance in the Rage of Demons storyline season alongside her fellow demon lords, Zuggtmoy appears in Out of the Abyss in a new form as the Demon Queen of Fungi. More at home in the Underdark than most other demon lords, she hatches bold plots that threaten all Faerûn—and which only stouthearted heroes can stop.